Shares look cheap at just over 6 times earnings. The industry, in general, though, trades at a cheaper valuation. Negative earnings growth seems to be keeping the share price under pressure. Existing parallelogram looks that it may break lower. Steel Dynamics, Inc. (STLD) is a stock which showed up on a screener we ran. The company at present has all the hallmarks of a strong value play. Why? Well, currently, the firm trades with a book multiple of 1.9 and a sales multiple of 0.7. Furthermore, its price to earnings ratio comes in at a very attractive 6.3 and its cash flow multiple of 5.6 looks equally attractive. With shares currently trading under the $34 handle, these numbers on the surface look compelling as one is potentially getting plenty of sales, assets, earnings and cash for long exposure here. A stable forward dividend yield of 2.7% and a low debt to equity ratio of 0.60 again add to the attractiveness of this potential value play. However, when one digs deeper, one will see, in fact, that this industry, in general, is actually trading at lower valuations than Steel Dynamics (which is basically manufacturing of steel products and recycling of same) at present. The industry is trading with an earnings multiple of 5.8 and a sales multiple of 0.4. Therefore, when we have a setup where the stock in question may not be as cheap as it appears, we like to turn to the charts to get a read on where we believe shares are headed in the short time. Value plays can remain "cheap" for a sustained period of time (sometimes years) when the industry in question is not expensive, in general. Being chartists, we believe that any possible fundamental argument that could affect the share price has already been reflected in price action. No matter how convincing a stock's forward-looking fundamentals or valuation may be, we invariably lead with what price is doing on the charts. So, from that perspective, let's dig in. After a multi-year bullish run, shares topped out in May of last year. We did get a bounce in December last year (along with the rest of the market), but price turned over in late February. What investors should be aware of here (which we alluded to above) is that although shares look cheap at these prices, look at where they have come from (predominantly 2015 and 2016). Back in '15, for example, the sales multiple dropped to 2015, and the cash flow multiple dropped to 4.2. What value investors want to know here, though, is whether those late 2018 lows will hold. 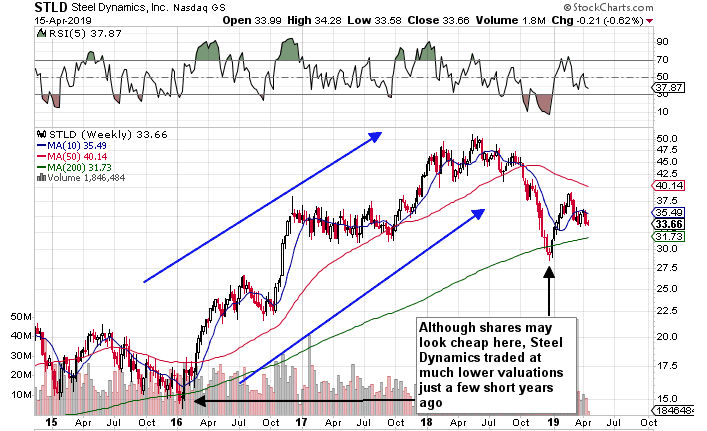 If we move to a more recent daily chart, we can see that shares have been undergoing a downward trending parallelogram. From our experience, these patterns can readily trend in either direction, so bulls need to be cautious here. What is worrying from a bullish perspective is two-fold. 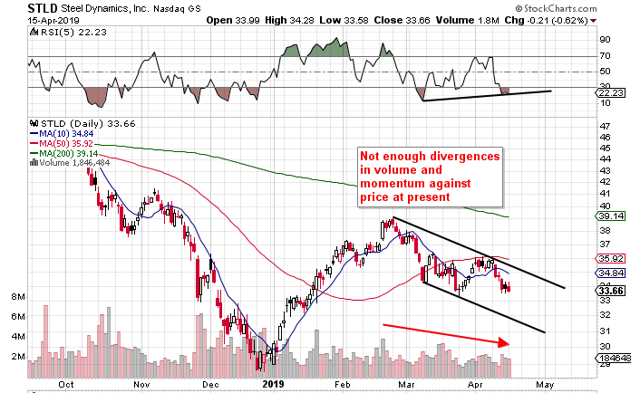 For the March lows to hold, we should be seeing divergences on the RSI oscillator. However, the recent April lows have not diverged to any meaningful degree against price. This demonstrates to us (taking into account the present pattern that is being played out) that lower lows may be on the cards here. We also use volume as a sound predictive tool when looking for trend changes. If higher prices were on the way, we should be seeing buying volume being higher on the up-days as opposed to selling volumes on the declines. Suffice it to say, this is not the volume pattern that has been playing out. Earnings growth is what normally moves stocks on the street. Earnings per share in Steel Dynamics is projected to come in around $4.09 this year. This will be a substantial drop compared to 2018. Although 2020 projections appear to be stabilizing, the street seems to believe that the jury is still out here. This is what we are also seeing on the charts. Therefore, we will remain on the sidelines for the time being. The firm is expected to announce its first quarter earnings in less than a week's time.